So, what is missing? 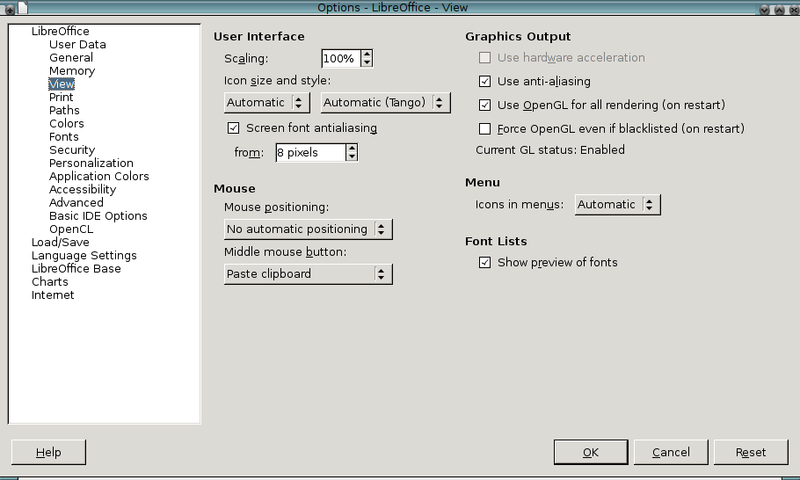 Why does LibreOffice not use OpenGL? Check the ebuild,it doesn't have an opngl useflag. Frankly why would it need opengl? This is not an argument. Only because an ebuild does not have the opengl use-flag this does not necessarily imply the application does not support OpenGL. A use-flag only makes sense if you have the choice to toggle between OpenGL support and no support. If an application mandates to be compiled with OpenGL support, i.e. sloppily spoken OpenGL support is always enabled, then there is no need for the use-flag either. This is exactly the case with LibreOffice. If you look closely at the ebuild, you see that it depends on OpenGL. The point with LibreOffice is that it decides to use or not to use OpenGL at runtime. Hence, OpenGL support is always compiled in at compile time. For example, hardware acceleration for smoother scrolling, less CPU-intensive slide transitions, etc. pp. Probably for the same reasons why MS Office uses DirectX. Not only games benefit from hardware acceleration. Back to my original question: Why does LibreOffice assumes that OpenGL support is not available at runtime? I also have libreoffice though use it only occasionally. Also I'm on nvidia-drivers,not nouvau. I set it in the config including "even when blacklisted" but still no support. I have no idea how to solve this. Here Current GL status: Enabled. @charles17: Nice for you. Maybe you could elaborate about your configuration, what driver, output of glxinfo, etc.? Perhaps this way we will find out what the difference is. Thanks! @charles17: Nice for you. Maybe you could elaborate about your configuration, what driver, output of glxinfo, etc.? ! glxinfo I don't have. Which program to install to get it? glxinfo is part of x11-apps/mesa-progs. Please run "glxinfo | egrep OpenGL"
It would also be of interest to know what graphic card you have and what driver is used. Perhaps it is specific to nouveau and or nvidia cards. I did try LibreOffice with OpenGL. In calc, it became unusable. The display was just the title bar wrapping from top to bottom in the window. The menus and mouse clicks still worked, so I was able to turn it off again. I'm using a GeForce 9800 GT video card with the nouveau driver. The card is too old for the binary blob. But different to charles17 the LibreOffice installation does not use OpenGL on my laptop. I think is time to ask upstream. Yes, I am. We need to distinguish three "parts" of the driver (or however you want to call it): The kernel part, the general X11/Xorg part and the Mesa part whereby the latter is responsible for OpenGL. Core i5, Core i7 as well as Atom CPUs with integrated graphics. If M is selected, the module will be called i915. You can see, Core i7 and 965G is explicitly mentioned. However, the kernel driver is always called i915. As xorg is not aware of i915 or i965 they will need to be addressed as Driver "intel". Hence, the Xorg driver is called intel. "intel" is for x11-base/xorg-drivers and i915 resp. i965 are for media-libs/mesa. Hence, only the Mesa driver is called i965. I realize I'm on Mesa 13 rc2, but it also didn't work under mesa 12.x either. ~ $ glxinfo | grep "OpenGL"